Propet Shoes. Leather with shirred leatherette. E width. Removable insole to accommodate orthotics and enable a customized fit. 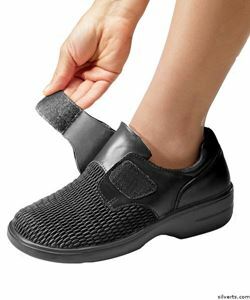 Adjustable Easy Touch hook and loop fastener shoes. These comfortable walking shoes by Silvert feature built in arch support. Slip resistant tread soles. These shoes for elderly seniors are the perfect choice in comfort.